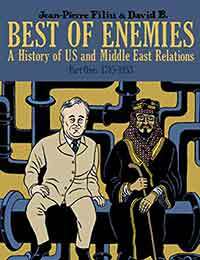 Best of Enemies: A History of US and Middle East Relations Average 0.00/5 - out of 0 total votes. It was an American who first described the Barbary lands of the Mediterranean basin as the Middle East – a region by which America, ever since its own revolutionary foundation, has always measured its power. Acclaimed historian Jean-Pierre Filiu and award-winning artist David B. here tell the story of the blockades, broadsides and betrayals of this foreign affair – a wary co-dependency that, from the Epic of Gilgamesh to the Eisenhower era, and from gold to oil, has continued to define our modern world.